Basil,that indispensible warm-weather herb and best friend of tomatoes has been a gardener’s favorite for years. Yet during my first 25 years, basil was no more than a jar of gray, flavorless flakes in the spice cabinet –a far cry from the verdant and evocatively fragrant summer staple we know as basil today. 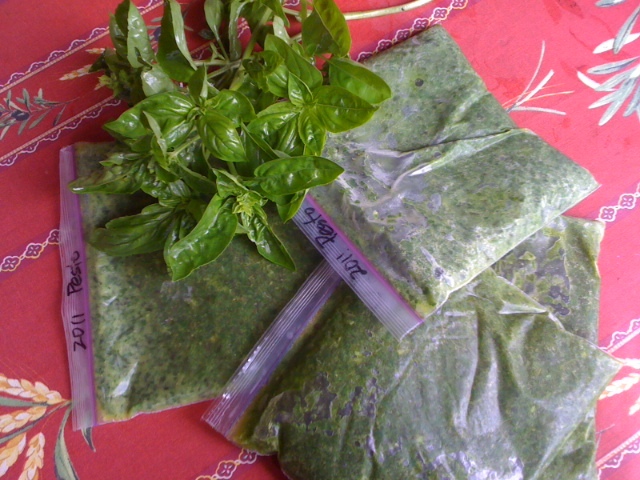 Basil withers at any hint of frost so as the days shorten and temperatures start to dip in September, the urgency increases to make pesto and freeze it for the precious fresh-from-the-garden taste in winter. Back in the late 1970′s, Eric hitch-hiked to San Francisco where a food-savvy friend introduced him to basil pesto at an Italian diner. He returned full of enthusiasm for this amazingly simple, radically different and deliciously addictive pasta sauce. At that time, we’d never heard of fresh basil and it wasn’t easily available commercially – at least not at the places we shopped. So he tried making it for us using not-so-fresh spinach and parsley along with some dusty dried basil. Needless to say,we were not impressed with this new dish! Within a few years of that introduction,basil pesto had become a fixture in trendy restaurants and sweet basil found a permanent place in home and market gardens. It’s hard to believe that before then,summer could come and go without the taste and smell of fresh basil! I have since grown,harvested and made basil pesto for freezing every year, aiming for at least dozen batches,one for each month of the year. Five or six plants started indoors in March and planted out in June,provide plenty of leaves for our household. Having only a refrigerator freezer, I store each batch of pesto in a freezer bag and flatten it when freezing it to conserve space. I find this much more convenient than the better-known method of freezing pesto in ice cube trays. If you want just a little pesto, you can easily break off a corner of the frozen pesto from the bag and leave the rest in the freezer. If not using a whole batch for a meal,we often transfer the pesto after it thaws to a glass jar,where tightly sealed,it keeps well in the fridge for weeks adding pizazz to sandwiches, soups, salads and sauces. Thanks to Eric’s penchant for watching cooking shows,we discovered a surprising way to avoid the oxidizing effect and preserve the rich green color of pesto for the winter table. By blanching the basil leaves! Here’s a recipe we’ve adapted from the execellent and accessible Italian recipes of Michael Chiarello. If freezing the pesto,then just prepare the ingredients above. If making a pasta sauce immediately,then add a few tablespoons of nuts and a half cup of grated Parmesan cheese. Prepare a large pot of boiling water (unsalted) for blanching and an ice water bath in a large bowl or sink. Drop the basil leaves into the boiling water and stir for about 15 seconds. Remove and shake off excess hot water then plunge leaves into the cold water,stirring to cool the leaves as fast as possible. Gather up the chilled leaves in your hands and squeeze as much of the water out as you can. Roughly chop the leaves and blend with oil, garlic and salt until oil turns green. Blanching might sound fussy and time consuming but I find it takes less effort than processing the leaves raw. I always washed and removed the water in a salad spinner anyway. That took just about the same amount of time as blanching and somehow seemed more tedious. When making multiple batches of pesto (3-4 batches can be made without it being a major chore), I blanch all the leaves first,ending up with a fist-sized pile of limp basil leaves from each 4 cup batch. This saves time and also makes it possible to take a break from the kitchen or even refrigerate the blanched leaves in a sealed container for another day before processing and freezing the pesto. The Chiarello recipe calls for regular (non-virgin) olive oil, under the theory that extra-virgin will overwhelm the flavor of the basil. That certainly lowers the cost of making pesto and keeps the pesto lighter. But I prefer using half extra-virgin for added richness. Try this pesto with some newly-dug baby potatoes for a lip-smackingly delicious pesto potato salad!